Made in 100% pure genuine calf hide leather, this product is multi function capability. Looking for a deal buy ​5 for the price of 3 in two color option?. For our other styles of Smoking tobacco pouch. Finished in a gold colour. Arm band for rizla or holding your roll up/cigarette. 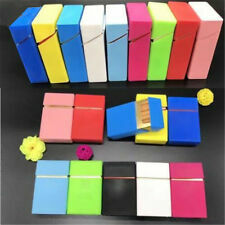 Silicone Cigarette Case Box Holder Tobacco 20 Cigarettes Pocket King Size Cover. Fits regular size cigarettes. The silicon cigarette case is very attractive, and appealing to the eyes. 1 x Cigarette Case (Random Color). Made in 100% pure genuine calf hide leather, this product is multi function capability. Nickel coloured double cigar holder. 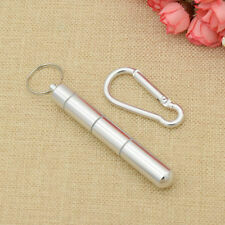 Size - L17 x W4.2cm approx. Ok - non PC these days - but here is a really really old cigarette case made of leather. Been in the same family for over 50 years. Just in a drawer. Not sure of the specific age but it could be as old as 70 years. Looks like a child had used it as a ‘wallet’ at some point .... hence the writing !! The inscription states;- Smoke like ‘Helen B Merry’ which made me smile. Can’t really say any more about it. It’s in good condition for the age - not sure if someone would use it as a cigarette case again or simply keep for a collection or future. Message me for further info. From a smoke free home which is quite ironic !! Elastic on inside is slightly worn. Made in England. If the pictures were taken on the green board - Every square equals to 1 cm. Good Condition. Product:Automatic Cigarette Case. Cigarettes pop out from the top automatically by by sliding the side switch. Material: Aluminum Plastic. Made of high quality aluminum, strong and durable. Cigerette ciggarette cigarete cigarrette sigarette. Cigarette case is made out of Aluminium. Attractive Cigarette Case Holder - Stainless Steel -Polished To A shiny Silver Finish. Item Size. "KINCRAFT" MADE IN ENGLAND embossed inside. -EW engraved on the front top. Leather covering with silk and red velvet interior. Stamped T&M EPNS. An old cigarette case. Clip does lose and opens very good. Back is curved in. USED 11 cm long 8.5 cm Width. Circa 1900. Leather covering with silk and velvet interior. (grams approx ). Humphrey Bogart (Hollywood actor) on the front and back. In a good condition for its age. This cigarette box has has been layered with several layers of 24K gold. so it can not fade away. 24carat (ct) Gold Plated. 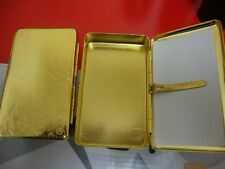 24K gold plated Egyptian Style Art work cigarette case tobacco box holder. With A Certificate of Authenticity. This cigarette box has has been layered with several layers of 24K gold and has been sealed.so it can not fade away. The wide range is characterized by its high quality and its elegant finishes. A masterpiece that catches all eyes - in your living room, your office or your bar. Cigar case: 4 cigars. Material: High quality Italian leather. A lovely item for a collector of antique cigar or card cases or general Victoriana or Edwardiana. Search aids: Victorian, dressing table, dressing room, tobacciana, smoking, match boxes, vesta cases, Breweriana, cinema, film. Has the odd little imperfection that you get with such things of this age, it all adds to the charm of the item. I hope you like this charming item as much as I do. CIGARETTE BOX. A bygones gift makes a perfect present. Cigarette case brass, 24K Gold Inlayed. Condition is Used. Dispatched with Royal Mail 1st Class. Has A Lined Zipped Pouch To Carry The Tobacco. 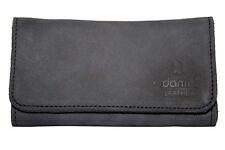 Features A Smaller Zipped PU leather Pouch. This is a PU leather tobacco pouch. Best piece for your smoking accessory. 1 x Random Colour Tobacco Pouch. Use For Up To 16 Cigarette in the Case. Each Side 8 8 cigarette = 16 Regular Cigarettes. Attractive Cigarette Case Holder - Stainless Steel -Polished To A shiny Silver Finish. Size: Width 95mm x Height 80mm x Depth 18mm. Clark Gable (Hollywood actor) on the front and back. Covered tobacco, Cigarette & Cigar Box Circa 1960.